Doggett’s Coat & Badge Wager is the prize and name for the oldest rowing race in the world. Up to six apprentice watermen of the river Thames compete for this prestigious honour, which has been held every year since 1715. The 4 miles 5 furlongs (7,400 m) race is held on the Thames between London Bridge and Cadogan Pier Chelsea, the sites of the Old Swan Tavern and the Swan Inn Chelsea respectively, passing under a total of eleven bridges en route. Until 1873, it was raced every 1 August. Competitors rowed four-seater passenger wherries, the boats used by watermen to ferry passengers across the Thames, against the outgoing (ebb) tide. There are stories of the race taking over two hours to complete. Today it is raced on the incoming (flood) tide, in contemporary single sculling boats. The founder of the race, the Irish actor and comedian Thomas Doggett, was born in Dublin and moved to London in 1690 to pursue his career. In 1715 Doggett, a keen Whig, founded the prize of Doggett’s Coat and Badge in honour of the House of Hanover, in commemoration of King George I’s accession to the Throne on 1 August 1714. Doggett himself organised and managed the race each year until his death in 1721. 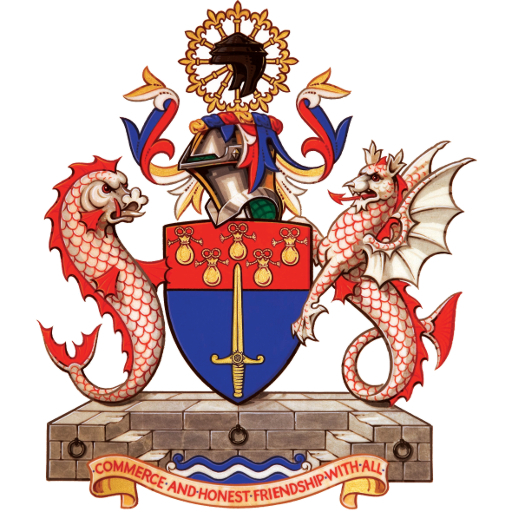 To keep the Race alive, the executors of Doggett’s Will entered into a Deed with The Fishmongers’ Company, which effectively passed the Trusteeship of the Race to the Fishmongers. In 1722 the Fishmongers’ Company organised the race for the first time and has faithfully complied with Doggett’s Will ever since. The winner’s prize is a traditional watermen’s red coat with a silver badge added, displaying the horse of the House of Hanover and the word “Liberty”, in honour of the accession of George I to the throne. The time now taken to complete the course is between 25 to 30 minutes and in 1973 Bobby Prentice, Waterman & Lighterman, and now also Bargemaster to the Fishmongers’ Company, set the fastest recorded time of 23 minute 22 seconds. 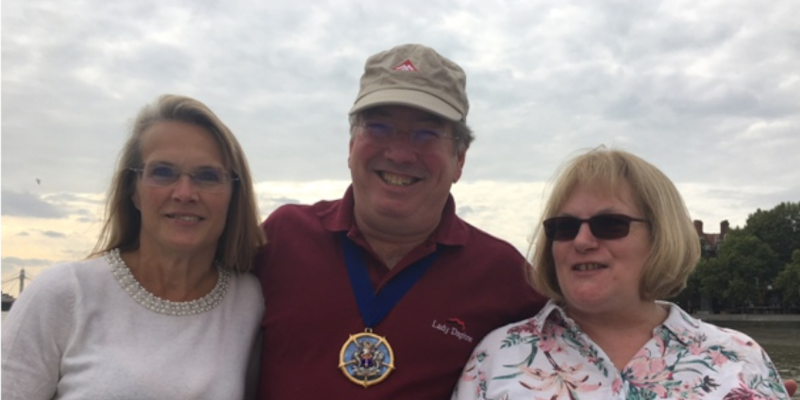 This year Doggett’s Coat and Badge Wager was part of the Totally Thames Festival though it remains independent, organised jointly by the Company of Watermen & Lightermen and the Fishmongers’ Company with its own day, Tuesday, 4 September. The Wager featured as part of a Riverside Exhibition outside Tate Modern between 18 August and 30 September and the Wager had its own Exhibition in the Guildhall Yard between 7 and 25 September. Oral histories and photographs are being recorded of previous Doggett’s contestants and a film produced about Doggett’s Wager. The Master is a craft-owning Freeman of the Company of Watermen & Lightermen, and a former rower, who, at the suggestion of the Clerk and with the help of Elisabeth welcomed 50 people on board the King Edward, to the most warm hospitality of Gary, Lee, and Jake. Thanks to Past Master Sue Hughes, we were accompanied by several Friends Of St Katharine Docks. With a barbeque, copious drinks, and good tour-guiding by Gary, we had a small tour ‘downriver’ from 14:00 to 15:30, then returned to London Bridge to watch the race preparations. The race start was at 16:00, but we moored close to the finish. In the end, only two boats raced out of a possible six. There were four potential entrants, but entrants have to pass their exams. On the day only two qualified. 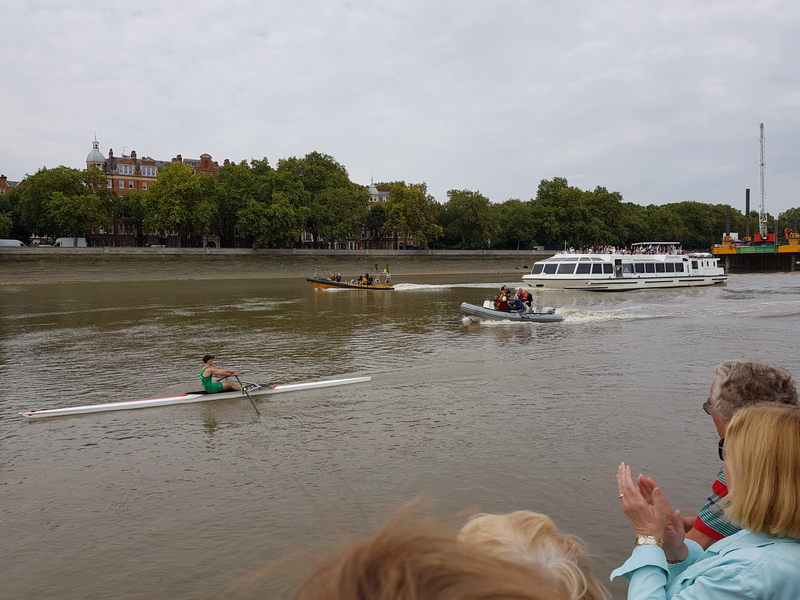 So this, the 304th edition of the Doggett’s Coat and Badge Race was contested by two rowers in central London, with Alfie Anderson prevailing in 25 minutes and 27 seconds. For many of us it made the Tour de France look elongated as the two rowers whooshed past us. Whoosh! Dog gone, nearly missed it. Of course the Master, in his shorts and sandals, insisted that ours was “The Badge”, but the rowers had long passed us by. By the time we returned, via Westminster Pier and then on to St Katharine’s Pier, we had had one of the most panoramic trips of London passing 24 times under bridges.